Automatically generates the driver code for the project in C, C#, Visual Basic .NET, Python, Java Delphi (Pascal), or Visual Basic 6.0. Supports any USB/PCI device, regardless of manufacturer. Applications are binary compatible across Windows 10/8.1/Server 2016/Server 2012 R2/8/Server 2012/7/Server 2008 R2/Server 2008/Server 2003/XP. Applications are source code compatible across all supported operating systems — Windows 10/8.1/Server 2016/Server 2012 R2/8/Server 2012/7/Server 2008 R2/Server 2008/Server 2003/XP, Embedded Windows 10/8.1/8/7, Windows CE (a.k.a. Windows Embedded Compact) 4.x–7.x (including Windows Mobile), and Linux. Can be used with common development environments, including MS Visual Studio, Borland C++ Builder, Borland Delphi, Visual Basic 6.0, MS eMbedded Visual C++, MS Platform Builder C++, GCC, Windows GCC, or any other appropriate compiler/environment. No WDK, ETK, DDI or any system-level programming knowledge required. Detailed examples in C, C#, Python, Java and VB.NET. HLK / HCK / WHQL certifiable driver (Windows). Stable: Field-tested on thousands of HW and OS configurations. Enhanced Chipset Support: Silicon partners libraries to jump-start your driver development. Special samples for various PCI/USB chip vendors, such as Altera and Xilinx. 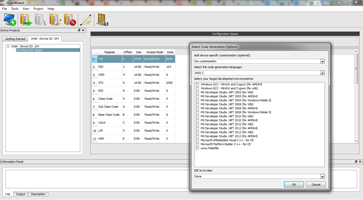 WinDriver generates a skeletal driver code, customized for the user’s hardware. Multiple OS support and cross platform: WinDriver product line supports ?Windows 10/8.1/Server 2016/Server 2012 R2/8/Server 2012/7/Server 2008 R2/Server 2008/Server 2003/XP, Embedded Windows 10/8.1/8/7, Windows CE/Mobile, and Linux. The same driver will run under all supported operating systems without any code modifications. Just recompile! Performance Optimization: Use WinDriver’s Kernel PlugIn technology to develop your driver in the user-mode — then run performance critical sections of it in the Kernel Mode (Ring 0) to achieve optimal performance. HLK / HCK/ WHQL Certifiable Driver: WinDriver’s Windows drivers are WHQL ready — you will not need to invest time and efforts on making your driver WHQL compliant. Jungo also can prepare the WHQL submission package for you. With Specific API for Server such as IPC, Buffer sharing, SRIOV and more. To enhance your WinDriver usage for you Server FPGA based devices. WinDriver in your development product, API or SDK. 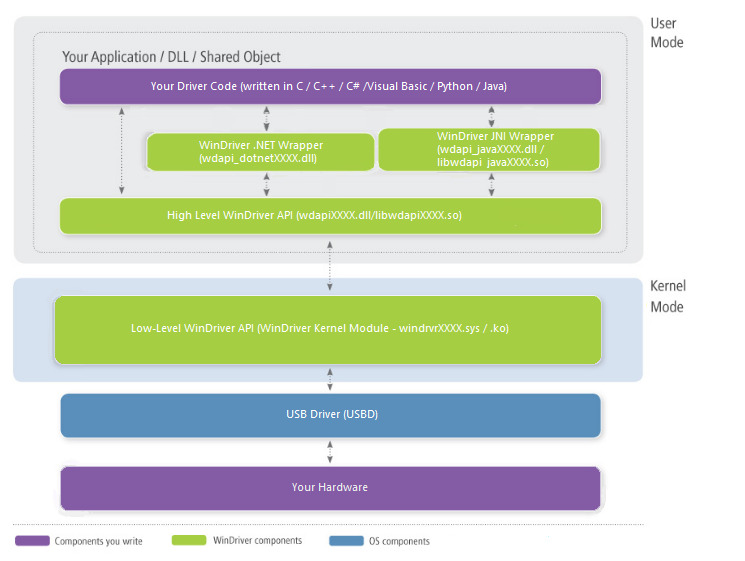 If you wish to use WinDriver within a development product, an API, or any part of a development product or environment you need to purchase the WinDriver SDK license. 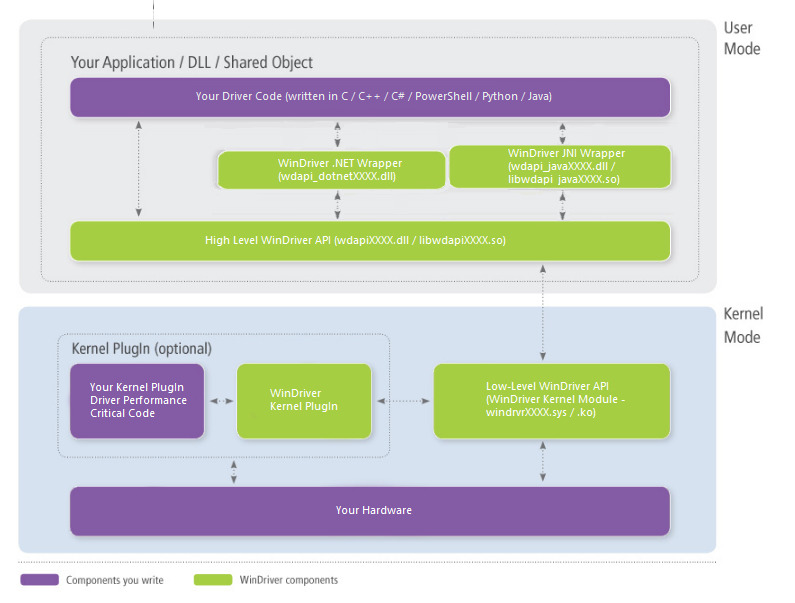 WinDriver support for Windows 10 IoT Core. Starting WinDriver 12.5 WinDriver supports Windows 10 IoT Core x86, x64 and ARM. WinDriver features a set of ready-made libraries and hardware access functions that provides enhanced support for our PCI/PCI Express and USB hardware Partners. WinDriver has thousands of customers worldwide that have used it to create numerous design wins. From scientific equipment to defense systems, from medical devices to consumer electronics, WinDriver assisted customers in focusing on their core expertise, by providing a straightforward yet reliable driver development solution.